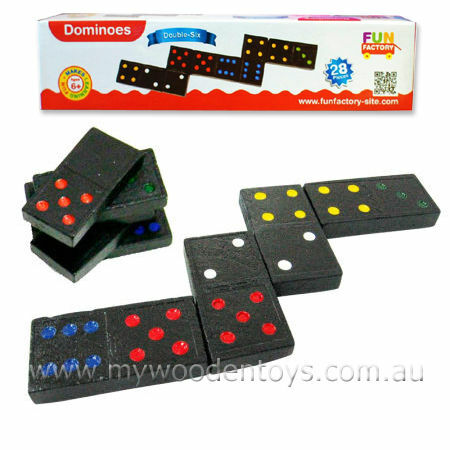 Dominoes Wooden 28 Piece Set are a sweet little set of black wooden dominoes. Each domino is engraved and has recessed dots so they don't rub off. This set comes in a cardboard box with instructions detailing one version of this traditional game. The Domino game dates back to Egyptian times and has been played in various forms through the generations. Dominoes can also be used to build and stack or to set up in row and knock over so they fall one after the other. This is a sweet simple set with a dragon on the back. Size: Each tile is 4.5cm x 2cm x 7mm thick. We like this because: "A great game and a sweet little set."